Today’s post is a little bit longer than normal, because I’m going to talk about three things – buying, storing, as well as how to boil an egg. If you just want to know about the boiling part, skip ahead. Eggs are a staple food all over the world. Apparently, the average American eats about 250 eggs per person, per year, and the average hen lays about 250 eggs per year. So somewhere out there, there is one hen whose sole purpose is to provide you with your eggs. Fortunately, the grocery store acts as the middle man. When buying eggs you get to choose which size and color you want. Size matters, color doesn’t. White, brown, or South American light blue and green eggs are all the same on the inside. Official sizes are Peewee, Small, Medium, Large, Extra Large, and Jumbo. It is rare to see Peewee and Small eggs in grocery stores here in the USA. Sometimes when you open a box of eggs one or two seem smaller than the rest. The cartons of eggs are actually sold by the total weight of the carton, not each individual egg. Most recipes nowadays use large eggs as the standard size. 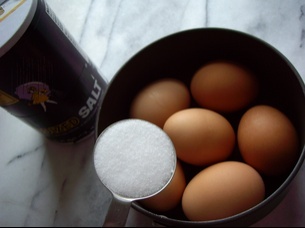 Before putting a carton of eggs in your grocery cart, open the carton and make sure there are no cracked eggs. Move each egg slightly to make sure none are stuck to the carton. If any are stuck, choose a different carton. Always buy eggs before the sell-by date on the carton. If stored properly in the refrigerator they should keep 3-5 weeks from the time you bring them home from the grocery store. Here’s what to look for when you crack open an egg: If the sticky stuff surrounding the yellow yolk in the center, (known as “the white”), is somewhat cloudy, that means it’s a very fresh egg. A clear white means the egg is ageing, but still fine to use. If the white is pink or “iridescent” then the egg has probably gone off and should be thrown out. Sometimes, no matter how hard you try, by the time you get home from the grocery store, you end up with a cracked egg. It may have been cracked from the very beginning, and you just didn’t notice when you were checking them in the first place. For whatever reason, just throw the cracked egg away. There is no point eating an egg that may have an unwelcome history of germs! The only time it really is OK to eat a cracked egg is if it cracked while you were cooking the egg. That should present no problem. Although virtually all refrigerators in the USA have egg-holders on the door, that’s not really the best place to store eggs. There is too much temperature fluctuation on the door shelves. Consequently, the best place to store eggs is in the original carton that you bought them in. Buying and storing eggs is different through-out the world. My post “Born in the USA” explains why. You can freeze eggs BUT it can be a bit more complicated than just popping them in an ice-cube tray. PLUS both the taste and texture will be compromised. There are several very good sites that describe how to freeze eggs (if you must!) including oChef, the National Center for Home Preservation, What’s Cooking America. Also the USDA has a great general information page on eggs. Very few cooks (or cookbooks) agree on how to cook an egg. 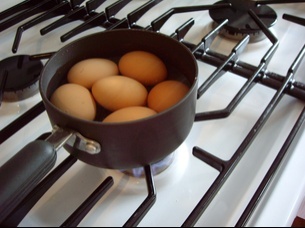 In fact, the BBC News announced a foolproof way to cook eggs. A temperature-sensitive ink stamped on an egg lets you know if the egg is cooked by changing color as you cook the egg! I don’t know why everyone uses the term soft boiled or hard boiled eggs. One should never ever boil an egg. In fact, you know when a “cooked” egg is overcooked by that green ring that you sometimes see around the yolk. It is perfectly fine to eat, but it doesn’t look great. When hard cooking eggs it is best to use eggs that are at least one week old. You will find that they are much easier to peel. Then cover the eggs with water. Place it on your stovetop on high heat. A lot of recipes will ask you to gently place the eggs in boiling water but I don’t like to do it that way. Too often while placing the egg in the water it has slipped, cracked and …well…hello poached egg! 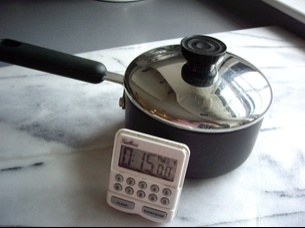 After the water comes to a boil, immediately shut off the stove and let the pot of eggs just sit on the stove, covered, for 15 minutes for large eggs. 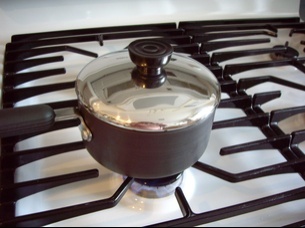 Some people say to remove the pan from the stove top to avoid over cooking. All pans hold heat differently. Once you make the perfect hard cooked egg, try to use the same pan and timing to make all future hard cooked eggs. After 3-5 minutes you will have a soft cooked egg. A hard cooked extra large egg should sit for 18 minutes. 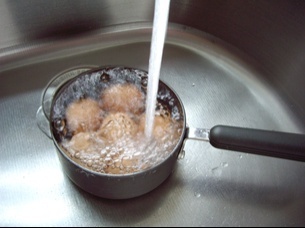 Drain the hot water from the saucepan and let cold water run over the eggs. It’s best to peel the eggs right before you use them. I know two ways to make the peeling easier. One is to crack the shell at the ends of each egg and return them to cold water. This allows the water to seep in. Or after the eggs have cooled just put them in the refrigerator for a few hours. Cold eggs are much easier to peel. A hard cooked egg should be put in the refrigerator within two hours of cooking and will keep in the refrigerator, unpeeled, about 1 week. is there a limit to the number of eggs one can cook in this manner ? I mean, what if i cook only one egg, will it be over cooked, or if I cook 10 at once, will they be slightly uncooked ? should I adjust for the number of eggs for a given pot, or as long as I stick to one layer it works? Great questions! I should have mentioned that the eggs should be in a single layer only. 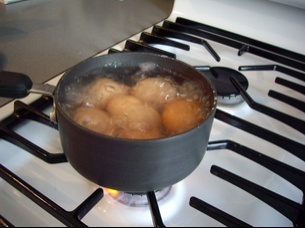 If you put several layers in the pot, the eggs will most likely crack and cook unevenly. That said the cooking time is the same for one egg or 10 eggs, as long as they are in a single layer. I notice that you refer to storing eggs in the fridge. I was taught that you should always cook eggs from room temperature and so I keep a few eggs in a basket on the counter and replace them the fridge once those are used. Thanks for saving me again. Decided to do a treat for our three children this morning and after promising soft boiled eggs I remembered the semi-poached disaster last time. A quick search of your site and ‘presto’! Delighted to be of help! I now have a 30 second video on How to Boil an Egg. Send me this recipe. There seem to be different methods for cooking eggs. It also prevents the green yolks from forming. Some thing to do with the cooling time and sulfer gases building up around the yolk, the longer it takes to cool them. I just discovered your website. I’m a college student who has just graduated with her doctorate and yet don’t have a clue how to cook some of the basics. It’s hard feeling so ignorant. I’ve been trying to find information on how to make things like hard boiled eggs (so many of the cookbooks seem to skip steps when talking about cooking basic things–so they’ll describe every step for chocolate souffle from scratch but not boil an egg or make meatballs!) and your website was a perfect resource solution. Thank you so much for putting this together. I’ll definitely be back again to read more recipe “How To’s”. Now off to try making a batch of hard cooked eggs. My husband, also has his Doctorate degree (Harvard) and does not know how to cook. He does proof read my posts and if he doesn’t understand what I’m saying, I have to re-write it! Tina, you are so right…cold eggs are much easier to peel! We always had hard-boiled eggs at the Tavern….and they always sat on the bar at room temperature…..is this healthy? Hi Patti, Ask the Tavern chef if they are made fresh daily – if so they are most likely OK. I was unfamiliar with this custom until my niece told me about seeing the very same thing inCharleston,SC. Does anyone know how this custom originated? Can you freeze eggs to prolong their shelflife? I recently read in a newsletter that to save money, when eggs go on sale, if ever, to buy as many as possible and then to crack the eggs into ice cube trays and then pop them out once frozen into plastic freezer bags for later use. Is this a safe and efficient way to store eggs? Yes Alf you can freeze eggs BUT it can be a bit more complicated than just popping them in an ice-cube tray. PLUS both the taste and texture will be compromised. I’ve been looking everywhere but can’t find anything about which way up to store eggs. I heard ages ago that the pointy end goes down because of the air bubble at the round end. Generally most eggs in a carton are stored this way. But a friend gave me a carton of their hens eggs, I noticed that they were in both ways. Do you know what is correct. Store eggs in the original carton from the store, in the coldest part of your refrigerator. 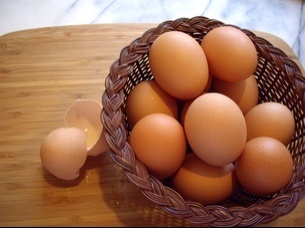 Because of the air pocket, eggs (usually) are packaged pointy side down, which is the way you should store your eggs. Kathy, I just love your website. I’m a college student who doesn’t know a lot about cooking but I would like to be able to cook well. As far as making it easier to peel eggs, as you are running cold water over them and they become possible to touch, shake one by one. It pulls them away from the shell while they are still warm and makes it easy to peel them. I have heard many times that the French do not believe in refrigerating their eggs (they claim that refrigerating eggs is an American thing). I have also noticed that a room temperature egg is much easier to work with. How long will an egg keep when un-refrigerated ? Jamie, thanks for the tip! Jbermo, There is a very definite reason why we put eggs in the refrigerator here in the USA and why in France they do not. “In the USA, government standards say all eggs must be washed and stored at temperatures no higher than 45 degrees Fahrenheit. 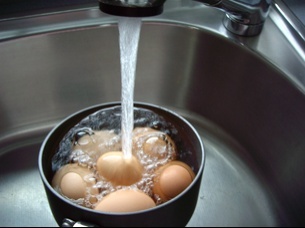 Washing the eggs is a good thing but it does leave the eggs without an outer coating and very susceptible to invasion by bacteria. Hence refrigeration of washed eggs is absolutely necessary.” Unwashed eggs do not need to be refrigerated) In many countries all over the world, eggs do not get washed before being sold. 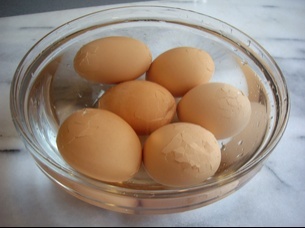 When using eggs in baking, it is best to bring them to room temperature before using them. Up in New England it was common to have hardboiled and pickeled eggs behind the bar for sale to be eaten with your beer, I have no idea if this prevailed in other areas. A “BAR” was not a restaurant and snack foods were the only foods served. Many men were working in factories and textile mills in the urban areas, many of these operated 24 hours a day and it was common for workers to stop at a bar for a few beers after work, 7am. was for the third shift workers like 5pm for most people except they were dirty and greasy after work unlike office and commercial workers who were clean and nicely dressed and can go out to a club or lounge on the way home. I remember my grandfather adding a raw egg to his beer and then drinking it down! I am in my sixties and have eaten hard boiled eggs all my life and 1 week storage in a refrigerator is ridiculous! I and my extended families have stored eggs over 30 days after Easter and never encountered a spoiled egg and spoiling after 2 hours unrefrigereated which is on a current aol web page is absurd! I grew up eating eggs stored on tavern back bars for several days and no bad eggs! My god people in early times had no storage facilities of any worth! 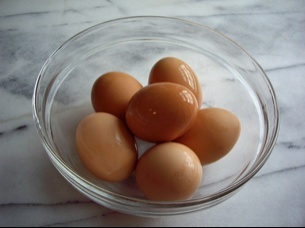 A good egg, be it hardboiled or fresh, will not spoil in one week under refrigeration. Now let me comment on 40+ years experience in the Food Protection field, I am sure the egg in question was no good when it came from the “cooler” ,but, how was the egg handled before? Many markets overload their coolers and some do not store them under refrigeration because they know the eggs will last until they are sold. Up until 25 year ago+/-most markets refused to refrigerate raw eggs,it took the USDA and/ or FDA to classify eggs as a “potentially hazardous product” to get compliance with the proper storage. For many years MAYONNAISE was a bad ingredient that caused “food poisonings” at church suppers and boy scout picnics and like meals. People involved in preparation never thought about how the food items were abused before the MAYONNAISE was added!